To truly understand The Unknown Soldier, it's essential to understand the context in which it was written. Following the so called 'Winter War' of 1939-40, when the Soviet Union annexed Finland and forced the Finns to concede key territories including Karelia, Finland went through a sort of collective depression of every sort. Morale was low, and it was in this setting that more 'positive' literature about the brave, unflagging Finnish soldier emerged. As Finland and USSR launched into a second war between 1941 and 1944, dubbed the 'Continuation War,' and past concessions came undone in the midst of wartime chaos, such literature and propaganda continued unabated in a drive to keep Finnish morale high. Indeed, this continued for about a decade after the Contination War as the nation struggled to deal with the aftermath of another, more devastating loss. 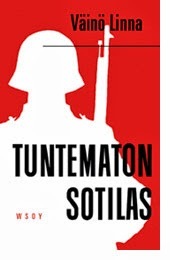 It was at this time (1954) that Väinö Linna, a former soldier himself, penned The Unknown Soldier. A harsh, uncompromising picture of the true nature of war for those actively fighting for their nation, The Unknown Soldier was an anti-war novel without actually being defeatist. It railed against the desolation and suffering of war while still showing the valour of the soldiers having to endure it. At first, the book was strongly criticised by many for being anti-nationalistic by highlighting the horrors of war and 'ignoring the bigger picture.' Linna himself had aimed to provide a more realistic view than the blind idealism espoused by many authors of the time. To quote Wikipedia, "In Linna's own words, he wished to give the Finnish soldier a brain, an organ lacking in earlier depictions — this was a barb directed at Johan Runeberg's The Tales of Ensign Stål, which admiringly portrays Finnish soldiers with big hearts and little independent intellect." The novel does not feature a single protagonist. Instead, it focuses on a range of soldiers in a single machine gun company, with different personalities and coming from all sections of society, as they deal with the horrors of war. These range from young, naive types to cowards, and even one particular soldier who adheres to the ideal of the unflagging Finnish soldier as described in Finnish propaganda of the time (despite Linna's oft repeated contempt for this notion, he is one of the few characters who survives the novel). Many of the officers and soldiers in the novel, all too aware of the reality of war and their own natures, scoff openly at the idea of the idealised Finnish soldier, knowing full well how different they themselves are from what the government and literature of the time suggest. As the tide turns against Finns over the course of the war and the novel, we see how these characters respond and evolve in their own different ways, and we see many of them die (indeed, Linna does not shy away from showing their deaths in the most blunt manner). This is a novel replete with personality archetypes, but it does not at any point sink to the level of representing them as hollow stereotypes and despite being unable to flesh them out in great detail (too many characters for that) does not leave them as blank figures. Instead, each character remains a very real person and each death continues to affect other characters as well as the readers in a very stark sense. The cold, depressing nature of losing one's comrades, something Linna himself had experienced, comes across almost too well. This is not a novel that shies away from reality. Indeed, some would even describe it as a documentary given how real the setting and details are (but still featuring fictional characters). But to Linna and thousands like him on the front lines, this represented far more than any of the propaganda parading around as literature at the time. This novel shows you in tremendous detail what life was like for a soldier in that war, what the country and regions had devolved into. Linna himself continued to write about the war with his 'Under the North Star' trilogy, a historical fiction narrative that had much in common with 'The Unknown Soldier' and even intersected in parts. But it was this novel, which overcame initial criticism to resonate strongly with a nation in recovery, that came to be identified with the nature of war and life for soldiers. Sadly, the translated edition is flawed, and from what I understand does not come anywhere near approaching the magnificence of the original Finnish work. That said, it's still an utterly real and fantastic account of what the war was like for soldiers, and a gripping narrative that conveys the historical and geographic setting perfectly.